What kind of bumpstop should I be using? I think I’ve seen some people use nylon rope that is tied off to a fixed point to stop the puncher at a certain point. The streching of the rope expends energy over a larger period of time, so the deceleration isn’t as harsh as the approach you are currently taking. Some people also use rubber intake wheels as mechanical stoppers. Key thing when doing a puncher is to match the mass of the plunger to the mass of the punched object. If you design the mechanism in a way that the plunger is free to accelerate, then only hit the object at the end (instead of rolling it the whole time, that would be more of a catapult), and if you match the massses, you’ll get great energy transfer (think billiards) and the puncher won’t slam the stop. You still need a stop in case of mis-fire though, but that could be elastic. Such a puncher worked great for the VexIQ BankShot, so I expect it to work well for similar Turning Point balls. This is one of those frustrating to “aha!” moments you’ll experience in robotics. To understand the solution to the problem, it’s best to approach this in a scientific manner. 1.) 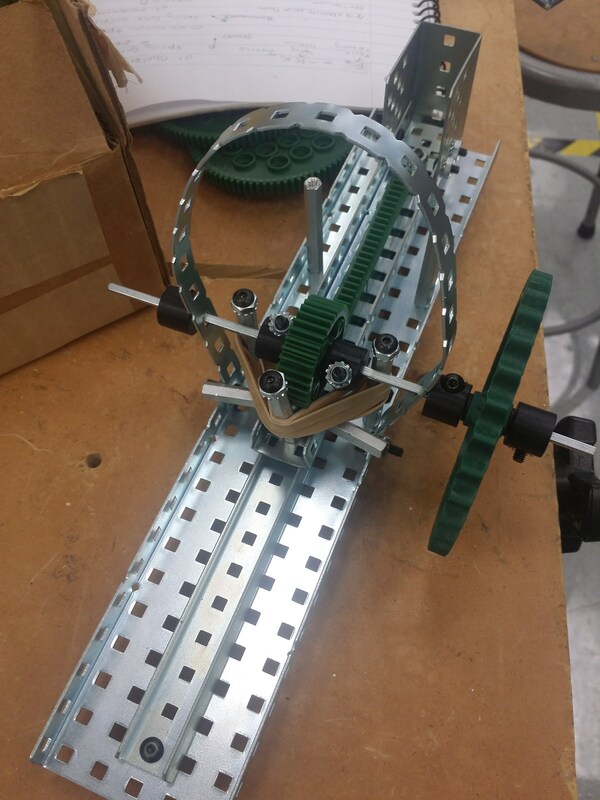 The gear drives the puncher back, using a linear slide. This process stretches the rubber band. Maximum tension is achieved at the tipping point, where the gear is cut. This is the moment of greatest potential energy. PE = 1/2 k x^2, where x is the distance between the two rubber band ends- in your case, the distance between the stand off on the puncher and the fixed standoffs on the five wide c-channel. k is your elasticity modifier- depending on the elasticity of the rubber band, you will store more or less energy. 2.) The gear “slips”, converting the stored potential energy into kinetic energy proportional to the square of the remaining distance: KE = 1/2 k xfinal^2 - 1/2 k xremaining^2. This is very important! Because only kinetic energy is transferred to the ball, you want the puncher to hit the ball when KE is at it’s peak. This occurs when xremaining = 0, as all PE has been converted to KE! Looking at your design, it’s apparent that the the puncher is prevented from ever achieving maximum KE- which would be when all standoffs are in line with each other. 3.) Before the stopping mechanism can act, the puncher hits the ball, transferring energy to the ball. This means that the kinetic energy the stopping mechanism needs to absorb is equivalent to KEpuncher - KEball + PE remaining -PEcurrent. I’ll break that down in a second. So! Time to calculate a solution! KEball = energy transferred to ball. An astute observer will note that not all energy was transferred to the ball- only some of it. This is quite important, as you will now realize that the ball can never fully prevent damage to the mechanism. So now we know how much energy needs to be absorbed. The only thing left to do is to figure out how to absorb the energy, or minimize the damage (work) it can do. In order to do so, we redefine damage to something a bit more scientific: Work. Option 1: Self explanatory, but if we decrease Mass, we also decrease how effectively we launch the ball. So, not viable. Option 2: Viable, but we would need the velocity to only be limited after contact has been made with the ball. This is possible: place the stopping mechanism in such a way that the rubber bands begin to pull the puncher back, away from the ball (after the ball has been hit) before the puncher hits the stopping mechanism. This solution also incorporates option 3. Option 3: Increasing the time taken to stop the puncher decreases the force exerted on the stopping mechanism at any given time. Example: laying a hammer on a shelf never breaks the shelf, but throwing the hammer onto the shelf at mach 2 would put a hole through the shelf. A solution to the problem would be feathering the stopping mechanism with cushioning material, rubber bands that act against the opposing force, etc. We are especially interested in force, as it is force that causes damage to your system. Therefore, limiting force of impact limits damage done. You do not want to strike at maximum kinetic energy like this. This is because the collision is not truly instantaneous. You want to strike a very short distance before maximum kinetic energy would have been achieved so that you’re at nearly maximum speed and are still pushing through the collision. This is akin to why people in sports are taught to keep pushing through a collision. I did a calculation a while back about following through with a sword swing or not; letting go at the moment of impact results in a loss of about 25% of the damage that can be done (very rough as damage isn’t clearly defined by the weapon and because different swords are built differently). Fortunately, the collision will probably happen over a short enough distance the this won’t matter much. While you stated correctly that this is an inelastic collision, you did not calculate for a general inelastic collision. You calculated for a perfectly inelastic collision, which means you’re saying the puncher and the ball stick together after the collision. The reason it’s called “perfectly inelastic” is because this results in a maximum loss of kinetic energy to deformation and the like. This works very well for such collisions if you’re looking at the moment of maximum compression, but it doesn’t work so well in evaluating the collisions overall. This is why @nenik gave the recommendation of matching the masses. @nenik was assuming an elastic collision, in which case you get a perfect transfer when the masses are the same, entirely stopping the puncher. I’m not sure how elastic the collisions will be, but steel or aluminum striking a relatively rigid plastic ball will be fairly elastic, a lot more so than striking a foam ball. Still, we’d be better off assuming a general inelastic collision and running a few trials to see just how inelastic the collision really is. Not wrong, but accidentally deceptive. The way you’re showing what to minimize or maximize to prevent damage makes it look like you want decrease the distance over which the puncher stops. You really need to address this a little differently. You’ll note you seem to contradict yourself later: are you trying to minimize force or work? Decreasing mass does not decrease how effectively you launch the ball. It will past a certain point, but it will increase how effectively you launch until that point. If the puncher has too much mass, it will retain too much kinetic energy in the collision. If the puncher has too little mass, it will rebound backward and also retain too much kinetic energy in the collision. You want to find the sweet spot. The reason why your system works better has more to do with the reality of the situation: Unlike in my calculations, which implicitly require the ball and the puncher to not deform at all upon contact, reality has the ball deforming significantly, so that the puncher is capable of transferring energy non-instantaneously. You are correct of course. 2.) True, my calculation was ideal. I’m sure it’s still within a 10% error, and was simply a matter of simplicity. 3.) Physically, it’s work that enables the transfer of energy in a system. The way I explained it is non-ideal, and I will revisit. “(Distance * (1/Time))” and “Work is force integrated over a spacial dimension” are probably the most misleading (generally, even if correct). “decrease the distance over which the puncher stops.” You’ll note that I grouped distance and time into one pair of braces, because it’s more a matter of minimizing that term than anything else. To be clearer I should simply tackle Force and not Work. 4.) Actually, it does. Higher masses give diminishing returns. Ie. a puncher with an infinite mass will launch the projectile at the velocity of the puncher at the time of collision, while a puncher with 0 mass would not launch the projectile at all. The maximum kinetic energy the puncher can lose at a given velocity is if the puncher has infinite mass, with that kinetic energy being 1/2 Mball * (Vpuncher^2). It is true that the collision becomes more elastic the lower the mass of the puncher is proportional to the mass of the projectile, but that is a consequence of the above. You’re contradicting yourself. First you say your calculations require no deformation. Then you go a calculation for perfectly inelastic collisions, which assumes maximum energy loss to deformation and the like. Yes, look at force. What you wrote is even confusing you. No, you do not want to minimize the (Distance * (1/Time)). You want to increase both the distance and the time over which it stops. = the direction the puncher is traveling to hit the ball. The solution gives a greater vb if the collision is not perfectly inelastic. So you’re assuming the puncher launches into the air, and we need to get rid of that assumption. The maximum kinetic energy the puncher can lose at a given velocity is if the puncher has infinite mass, with that kinetic energy being 1/2 Mball * (Vpuncher^2). I don’t have time right now to do this for a collision that retains perhaps 85% of its kinetic energy, so I’m going to go with the elastic collision for the following. So let’s see what happens. Let M go to infinity, and you get 1, or 100%. The puncher moves so slowly that the ball leaving at double that velocity has the ball barely moving at all. Let M go to zero, and you get 1, or 100%. The puncher has so little mass it moves quickly, but it also rebounds so easily that the ball barely moves. In both these cases (huge M and tiny M), the puncher retains too much kinetic energy. Can we find a time when the puncher retains none of this initial energy, when all of it is given to the ball? Yes, if you set M=m, then you get 0, or 0%. The puncher stops and the ball fires off with its maximum possible speed and kinetic energy given the constraint of the initial energy being constant. This is what @nenik was saying above. I’d like to do better, assuming some loss. But, as I said, that needs to wait for when I have more time. That isn’t really what determines elastic v. inelastic. @callen - thanks a lot. and for those who are still confused - most of the time, it is not elastic collision. Elastic collision demands the 2 objects to go separate ways and the total KE and momentum are conserved, which we all know, KE is seldom conserved. In real world applications, it is mostly inelastic collision (which is different from perfectly inelastic collision). For clarity for everyone, what @meng means by “separate ways” is not opposite directions, but in their own directions (i.e. not attached to each other). You can’t calculate this as an elastic collision. The ball weighs 55 grams! The puncher will never stop upon contact with the ball. Therefore it makes the most sense to utilize the inelastic collision assumption. My point was never to provide an answer on how to make the puncher come to rest simply by hitting the ball, as this will likely never happen. I’m aware that a perfect inelastic equation requires a loss of energy to deformation, heat, etc. However, we have, as of right now, no way of calculating these energy losses. Until we actually possess the balls, we will need to think ideally, and that’s all I’ve done. While you are right to say that you can’t assume elastic collision, based on your formula, you are assuming it is perfectly inelastic collision, which is not the same as inelastic collision. Both perfectly inelastic and inelastic collision will have momentum, but not the KE conserved. But perfectly inelastic collision is when both objects collide and then move off as one object (which is what you are assuming in your calculation), while inelastic collision is when the 2 objects will still move off separately (which is what @callen is saying). And even as I am typing, this thought came into me - both of you are right in different phases of the operation of the puncher. When the puncher first hit the ball, the ball will not be leaving the puncher instantaneously. There will be a small window of time that it will be perfectly inelastic, i.e. when the puncher hits the ball and it is pushing the ball forward together with it’s own movement. But once the puncher has extend to it’s maximum distance, thats when the ball will leave the puncher. And this is a case of “explosion” - one object spilt to many. And that’s when it is a case of finding the impulse (or the change in momentum) of the puncher in order to determine the momentum of the ball. Hope it makes more sense to everybody now… or… it is getting worse? The ball weighs 55 grams! The puncher will never stop upon contact with the ball. Just as I said, it will be inelastic. I just don’t have the time yet to do the inelastic calculation. The point of the elastic calculations was that I could do them very quickly and easily to show you that there is a sweet spot for the mass and that increasing mass beyond this results in a loss, not a gain, in the energy provided to the ball. The sweet spot will be different depending on just how inelastic the collision is, but the basic idea of the dependence on mass remains. I can also tell you’re really misunderstanding things when you comment on the ball being 55 grams as the reason. You can have elastic collisions between objects with significantly different masses. If you don’t believe me, look up “Compton scattering.” The problem here is the non-deep-space, macroscopic collision. Avoiding those two, we usually see significant losses. For example, with bounce juggling the best balls retain about 90% of their energy when rebounding off a sturdy floor. We can do better than that in very controlled circumstances, like using magnets and low-friction carts on a carefully leveled track in a classroom. Therefore it makes the most sense to utilize the inelastic collision assumption. Yes, as I said. But not a perfectly inelastic collision as you have done a couple times. Doing that is saying the puncher is flying off with the ball. Is that really how you think the slip punchers work? That the puncher itself launches off of the robot stuck to the ball? That leads to very incorrect conclusions, including the whole contradictory idea of stopping it while not stopping it. This works very well for such collisions if you’re looking at the moment of maximum compression, but it doesn’t work so well in evaluating the collisions overall. At the point of maximum compression, it can be treated exactly as a perfectly inelastic collision. In such a case, it’s not that the energy has been lost. Rather, a certain portion of it has been stored as elastic potential energy in the objects that are colliding. The billiard ball is about 160g. Yet, if you do a perfect hit, the cue ball will stop dead and the target ball leaves with most of the energy. Newton cradle is a nice example of a very efficient energy transfer, but anything over 80% would be good enough for shooting balls. How do the TP balls like punching (i.e. how elastic their collision with aluminum launcher is)? This is to be seen, but they very similar (just heavier) to VexIQ Bank Shot balls. In the Bank Shot season, I was mentoring 2 IQ teams. One built a puncher, one built a shooter that could be considered a linear catapult. So what is the difference? The “catapult” had a set of balls (9, 3x3 in a bed. 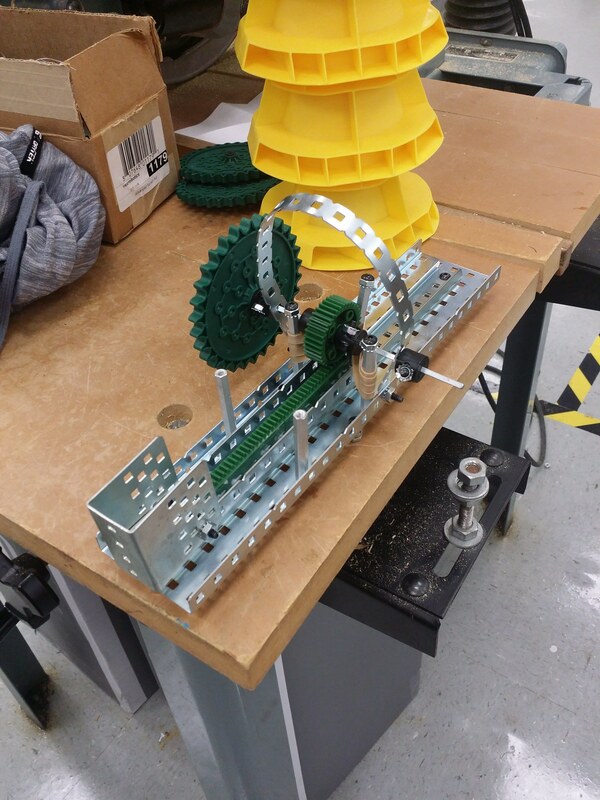 It wasn’t an original idea - my students have seen a robot like this and reimplemented the idea using their own mechanism, to a great wrath of the mentor of that other team) that were sitting on a beam, which was directly propelled by elastics. That is why it is a catapult - the balls were directly powered by the contracting rubber bands and when “leaving the barrel”, the push bar had the same speed as the balls and a tendency to break up. The puncher was very different. The balls were sitting in 4 lanes on a “perch” and were individually sticken by a 2x beams, which were first freely accelerated by rubber bands. The moving part (hammer) of the puncher was about 18g (slightly lighter than the ball) and there was quite a small overlap between the hammer on a hard stop and a ball awaiting the punch. See this match video showing the shooting efficiency, while in this video at 0:56, there is a great close-up of a single shot. where M is the puncher’s mass and m is the ball’s mass. This may not be the true overall ideal mass for the puncher because in making it light enough maybe it won’t slide as well, hit the ball as straight, etc. But whatever your design, you want to try to get the puncher’s mass a little below the ball’s mass if it doesn’t mess up the rest of the launch mechanism, at least assuming you want the puncher to mostly stop on its own and get efficient use out of the elastics. What will be confusing is f itself. That fraction f depends on a lot of things, including the masses involved, the specific materials and their shapes, and the speeds at impact. Consider throwing a bouncy ball at a window: slowly gives something reasonably elastic, while quickly breaks the window and is far from elastic. Consider Earth plowing through a tiny bit of debris in space, f will be nearly 1 even if the collision is perfectly inelastic. To start I would assume f is less than 1 but fairly close to 1. So, targeting a mass just a little less than 55 g with steel, aluminum, and plastic? I just put a single rack piece and a single steel gearbox bracket together on a scale. They came out close to 60 g. That’s a fair amount of steel, too, though there were no screws included. So it should be possible to get the mass of the puncher at least in the vicinity of the mass of a ball. Design it without worrying much about the mass. Once you have a good design, try to reduce the puncher’s mass toward a ballpark 50 g without messing up your design. After you see how much follow through the puncher has, deal with your stoppers to get things in the right place without damaging the stoppers. Alright, I realize I have made a mistake: I used inelastic and perfect inelastic collision interchangeably. That wasn’t very precise, and for that I apologize. While I do realize that the collision won’t be a perfect inelastic collision, I am still of the opinion that this approach yields a usable result. Yes, we will have losses due to a multitude of factors, and yes, the system only acts like a perfect inelastic collision upon initial contact, but sometimes it’s best to start simple before you get complicated. As for the linear slide situation: if you can effectively lower the mass to be near the mass of the ball, maybe the system will be more effective, and the puncher will easily stop, but I doubt that we will see punchers far below 100-150 grams. Even then, building an effective stop isn’t difficult. but I doubt that we will see punchers far below 100-150 grams. Even then, building an effective stop isn’t difficult. I can agree with this. Simple rubber-band based, aircraft-carrier-like hook stops the puncher with no damage anywhere.